It’s pretty funny, a little insightful and utterly ridiculous. And War Dogs is based on disgraceful true events. Ultimately, this story about two twentysomethings is a tale of good fortune derailed by pure, unadulterated greed. The story spans from 2005 to 2008 and involves two childhood friends, Efraim Diveroli (Jonah Hill, Moneyball) and David Packouz (Miles Teller, Whiplash). Efraim’s made it big as a government contractor, the kind that can leverage “small business” as a status and make a killing at the same time. He’s an arms dealer. And back in school he was deemed too bad of an influence to hang out with David. David’s down on his luck, having dropped out of college after 1 month and going on a streak of quitting or getting fired from six jobs before settling in as a masseuse pulling down $75 per hour. Then he tries to sell fine bedsheets to nursing homes. Yeah. High-concept thinker. Reunited after years apart, Efraim takes David under his wing and they go on to take their arms business to dizzying heights of success. They forge an empire built on military operations that spend $17,500 to outfit each soldier and $4.5 billion annually on air conditioning for the troops. 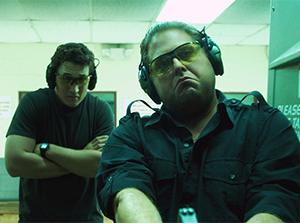 In some respects, War Dogs plays like an extension of the Hangover trilogy. That’s not surprising, given it’s directed by the same guy, Todd Phillips. Like honorary members of the Wolf Pack, Efraim and David aren’t the sharpest tools in the shed. But they found a niche and exploited it extremely well. Missions like running Italian-made Berettas into Baghdad by way of Jordan established them as guys who’ll get the job done. There was a substantial amount of dumb luck mixed in with their business strategy. There’s a lot of "looking the other way" to be done. Henry’s barred from working with the U.S. government. Chinese ammunition is contraband. And slides that should be greased… Well, that’s where things start to go greedy and Efraim makes a colossal mistake. The failure to make a simple payment of $100,000 to an Albanian subcontractor doing a thankless – but crucial – task sets in motion the downfall. That’s a $100,000 payment in a contract worth $300 million. The source material for this is Guy Lawson’s 2011 Rolling Stone article originally entitled “Arms and the Dudes”. It’s a crazy read. One that recognizes there’s plenty of shame to go around. Shame on Efraim and David for their shady dealings. But they’re also providing a legitimate service by way of lowest-bid contracting. Shame on the U.S. government for lacking better oversight on subcontractors. But there’s a war to be fought. And there are challenging geo-political issues to wade through. And there are the politics of saving face. In the thick of all that lies some of the fascination with this story. Things go from black-and-white to gray in a hurry. There’s American go-getter ambition. Then there’s greed. There’s making a semi-honest living, then it scales up to living large before falling into ashes. But what was learned by all this? That’s where War Dogs ushers in a heartache and a headache that reverberate even after the end credits roll. David served a mere 7 months of house arrest. Efraim, apparently, was sentenced to 4 years in prison. They can resume doing business with the U.S. government in 2022. Naturally, in this kind of story, certain elements and people are merged and situations altered in order to create a streamlined narrative and an emotional reaction. To that end, regardless of what facts might have turned to a creatively-licensed fiction, War Dogs pulls the right strings in crafting a raw look at the modern age.